Preheat your oven to 350°F and line 2 9-inch cake pans with parchment paper, rubbing down the sides of the pan generously with coconut oil. In a large bowl, stir together the almond flour, coconut sugar, tapioca flour, cacao nibs, baking soda and salt. Dump the banana in, but don’t mix it around. Make 3 large wells in the flour. Pour the coconut oil in one well, the vinegar in another, and the vanilla extract in the last well. You don’t want them to all mix together yet. Dump the water all over the top of the cake and now mix well with a fork, making sure the banana is evenly incorporated. Divide the batter between the 2 pans, spreading out evenly. Bake until the very golden brown, and a toothpick inserted in the center comes out clean, about 26-28 minutes. Let the cakes cool in the pan for 30 minutes and then transfer to a wire rack to cool completely. While the cakes cool completely, you can make the ganache by whisking together the coconut milk, almond butter and honey (or agave) in a small pot set over medium heat. Remove the pot from the heat, add the chocolate to the pan and let it stand, without whisking, for 30 seconds. Then, whisk until the chocolate melts and the mixture is smooth. Transfer the ganache to a bowl and place into the refrigerator to thicken and cool slightly for 1.5 hours. Once cooled, GENTLY place one of the cakes, bottom-side up, onto a cake pedestal and use an offset spatula to spread about 1/2 cup of ganache on it. Place the other layers, bottom-side up, on top. Note: these cakes are very delicate, so if you have trouble flipping the cakes without breaking them, so that the bottom side is up, it’s alright to place them bottom side down. 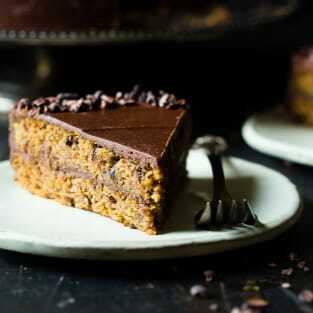 Spread a VERY thin coat of ganache on the top and sides of the cake, just to seal in the crumbs. Refrigerate until the ganache is set, about 30 minutes. Do not place the ganache back into the refrigerator, just let it sit at room temperature. Once the crumb coat is set, spread the remaining ganache on the top and sides of the cake. Garnish with additional cacao nibs, if desired. Place it back into the refrigerator for 30 minutes to set. Use a natural no-stir almond butter, such as Maranatha. If you use one that requires stirring, the oil separation can mess the ganache up. Time does not include chilling of the ganache or cake.